I love to watch people love things. I'm famous for cooking something, offering it to someone, getting settled, and creeping them out by intensely watching them eat it. Yancey has learned he has about 5 seconds before he has to say, "Wow, babe. This is good." Then I'll leave him alone and let him enjoy his food. Maybe more than anything I can think of, I love to watch my kids enjoy things. I'm sure I'm not alone in this, and this instinct is probably the reason some kids end up spoiled. 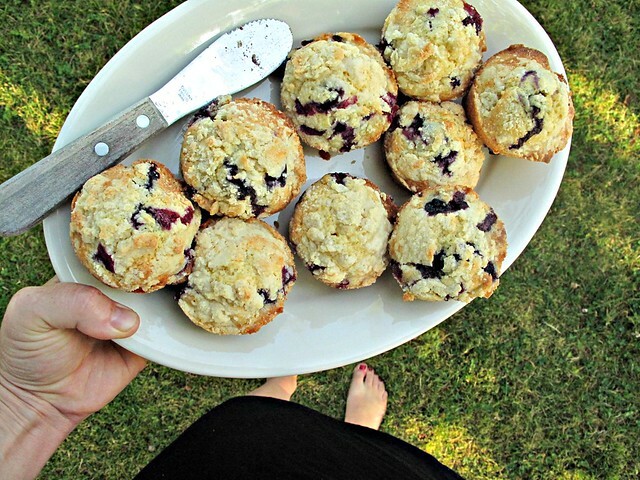 If blueberry muffins for breakfast is spoiling, I'm all over it. Wyatt sat across the table from me, his little sunburned shoulders and uneven teeth, still sleepy, and bit into a muffin. He rolled his eyes in pleasure and said, "These are sooo good, Mom. And they're still warm. Oh. Oh. Yum. Thanks, Mom." Then he had 2 or 3 more. Honestly. What is better than that? From my yellow Gourmet cookbook. I guess if you own it, you might not be a reader here. So don't go buy it. Stick around the Leftoverist long enough and I'll drag you through the whole thing. These aren't revolutionary, full of whole grains, or attempting anything creative. They are blessedly plain and tender and don't require getting out a mixer. Preheat oven to 375 and butter a 12-cup muffin pan. Whisk together flour, sugar, baking powder, and salt in a medium bowl. Add milk mixture and stir until just combined. Gently but thoroughly fold in blueberries. Divide batter among muffin cups and spread evenly. Combine all ingredients for topping in a bowl and rub together with your fingertips until crumbly. Sprinkle evenly over batter in each cup. 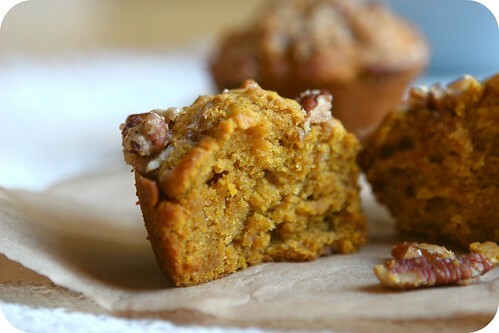 Bake until golden and a wooden pick or skewer inserted into the center of a muffin comes out clean, 15-20 minutes. Cool in pan for at least 5 minutes (10 would be better), then run a knife around edges of muffin tops and carefully remove from cups. Serve warme or at room temperature.